BK Tyres – keeping Royal Mail vans on the road. BK Tyres have a first-rate mobile puncture repair service. If you get a puncture, we may be able to repair it for a fraction of the cost of a new tyre. Repairs are often possible if (a) the puncture is in the main tread area and (b) you stopped quickly without overheating the deflated tyre. Our tyre fitters will always try and repair the tyre saving you money. 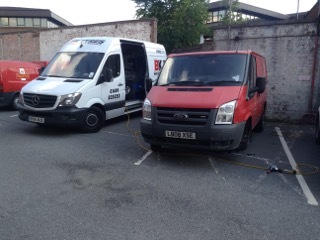 All our fitting vans are equipped with mobile puncture repair facilities. Our fitters will come to you – for just £36 we will get you safely on your way by either repairing the puncture or by putting on your spare wheel. Punctures are repaired to BSAU 159 standard. We offer puncture repair in Oxfordshire, including Oxford, Abingdon and Didcot. We also repair punctures throughout Buckinghamshire, including Aylesbury, High Wycombe and Marlow. In addition, our puncture repair service covers Berkshire, including the towns of Reading, Slough and Bracknell. When you make contact, please let us know if your vehicle doesn’t have a spare tyre. In this case we will ask you for the size and we will bring a spare with us. That way if the puncture is not repairable, we can still get you moving. Simply call 01491 835353 (or 03331 234242 from a mobile).